A scintillating first-out maiden winner going seven furlongs here on Oct. 28 and a winner via disqualification of the Grade I Cash Call Los Alamitos Futurity Dec. 9, Bob Baffert's McKinzie will try to remain unbeaten as he towers over six rival sophomores in Saturday's Grade III, $100,000 Sham Stakes, to be run at one mile over Santa Anita's main track. A gutty one mile maiden winner in his third start with Mike Smith aboard, Jerry Hollendorfer's Shivermetimbers will get the services of Flavien Prat and has the advantage of winning going a route of ground. The “Other Baffert,” Mourinho comes off a second place finish in the Grade III, seven furlong Bob Hope Stakes at Del Mar Nov. 11 and could be the speed of the race with the addition of blinkers. Kaleem Shah's homebred All Out Blitz, trained by Simon Callaghan, will stretch out off a hard fought six furlong maiden win Dec. 17 and will need to relax in the early going to be a contender. Named for the winner of the 1973 Santa Anita Derby who had the misfortune of running into the immortal Secretariat in that year's Triple Crown classics, the Sham offers the winner 10 Kentucky Derby qualifying points, while the runner-up and third place finisher will get two points and one point, respectively. Off at what proved to be a generous 7-2 in his debut, he was hammered to the 1-2 favorite when stretched out to a mile and one sixteenth in his second start, in which he crossed the finish line three quarters of a length behind his stablemate, Solomini. 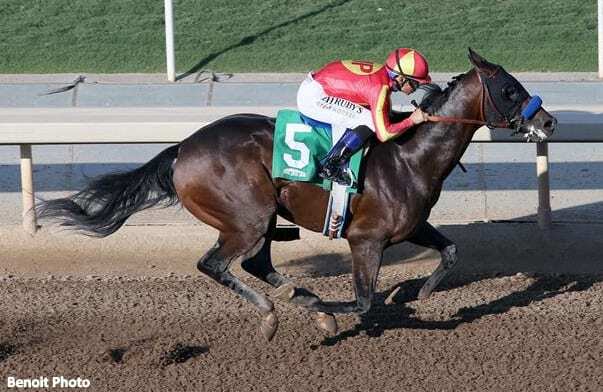 Subsequently moved up via a stewards' disqualification, McKinzie, all things considered, ran a huge race in the Los Alamitos Futurity, as he was forced to move early going into the far turn and finished like a top caliber colt. With “Big Money” Mike Smith set to ride for the third consecutive time, it looks this Kentucky-bred colt by Street Sense should have little trouble remaining unbeaten in his 3-year-old debut. A Kentucky-bred colt by Shanghai Bobby, he was no match for McKinzie in his second start, as he finished third as the 9-5 favorite going seven furlongs here on Oct. 28. His maiden win at a mile on Nov. 23 earned him a Beyer Speed figure of 90, his best from three starts. With Smith understandably opting to stay with McKinzie, it'll be up to Prat to ration his speed in his second successive one mile assignment. A $625,000 OBS 2-year-old in training sale purchase in March, this Kentucky-bred colt by Super Saver was an impressive 4 ½ length maiden winner on Sept. 30 and proved second best as the 6-5 favorite in the Bob Hope, losing by 1 ½ length. With the addition of blinkers, he figures to make the early Sham lead with regular rider Drayden Van Dyke up. This entry was posted in NL List, Racing and tagged Bob Baffert, Horse Racing, kentucky derby, mckinzie, santa anita, sham stakes, thoroughbred by Mike Willman/Santa Anita. Bookmark the permalink.